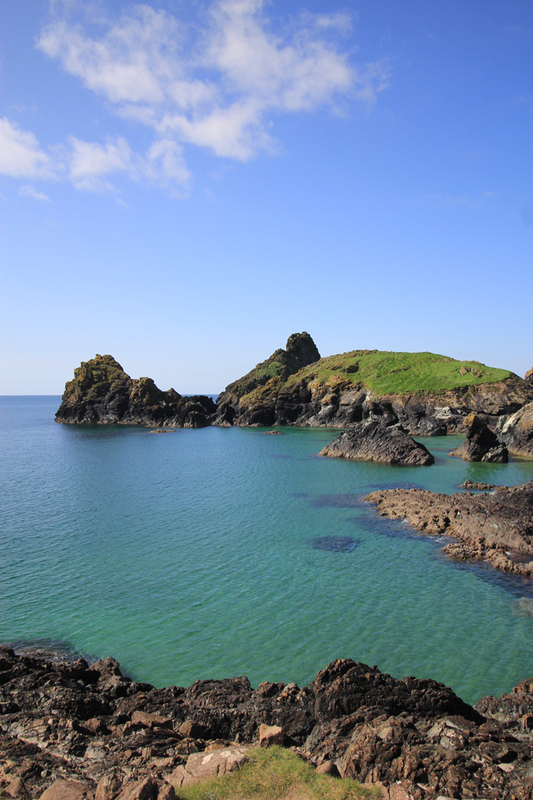 I fell for Kynance Cove in an instant. 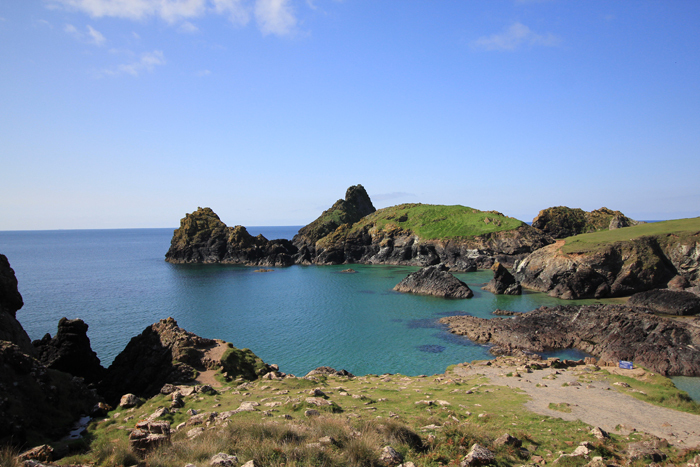 The rugged coastline slipping into the deep blue-green of the sea and the beautiful countryside leading up to it. 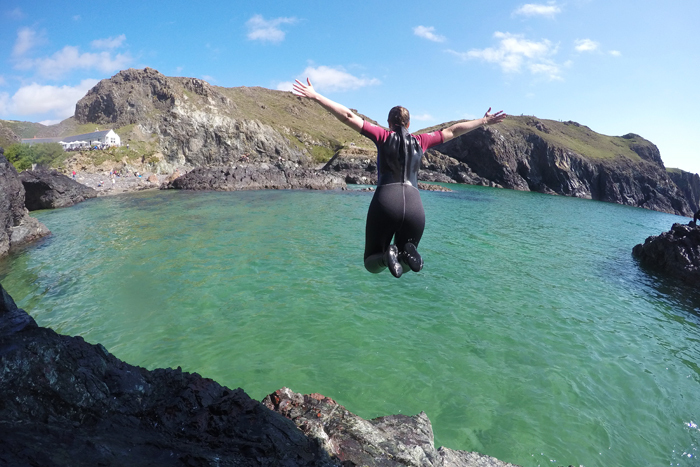 We had travelled along the coast from The Lizard and decided to stop here due to the promise of plunge pools and tall serpentine rocks perfect for a spot of (remarkably amateur) coasteering. 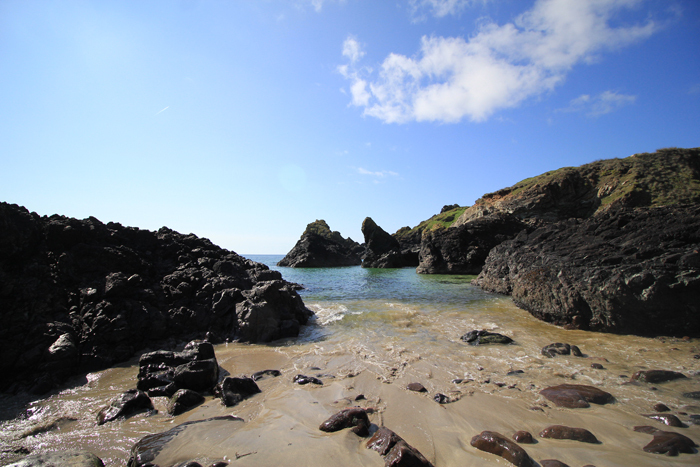 Since arriving in Cornwall I'd been desperate for a day warm enough to swim, so was relieved when this day finally arrived. 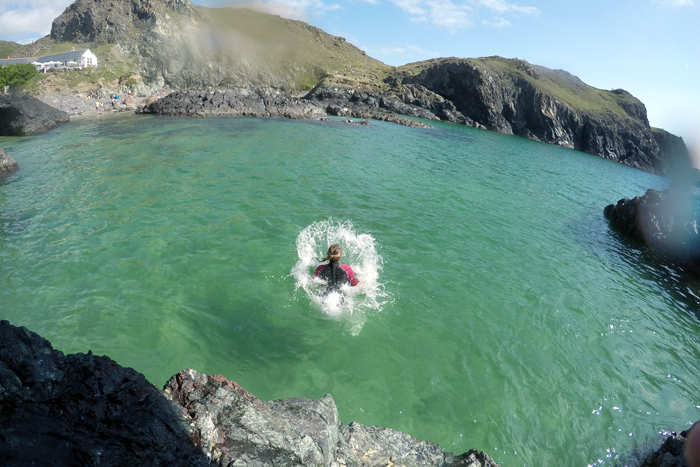 Having parked up, I excitedly rushed to get my wetsuit on, which if you've ever worn a wetsuit you'll know is no easy task. Equipped with our GoPro we hurried down to the beach. 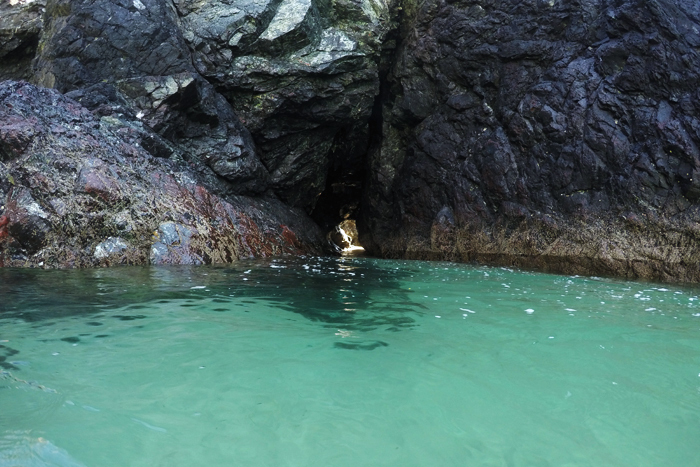 We explored sea caves and scrambled up the large rocks, watching as the cove changed with the tide, revealing a beach only accessible from the water. I watched as tens of little silver fish darted around us as we waded through the shallows and kept a close eye out for jelly fish as I swam in deeper water. The best thing about the day however, was exploring the rocks and their many rock pools...and then of course, leaping off them! I have always been drawn to water, which is possibly the hardest part of always having lived inland. This does however, make me very good at making the most of the times when I can swim, although stopping is usually the hardest part. On this occasion I almost had to be forcibly removed from the water by Kyle. 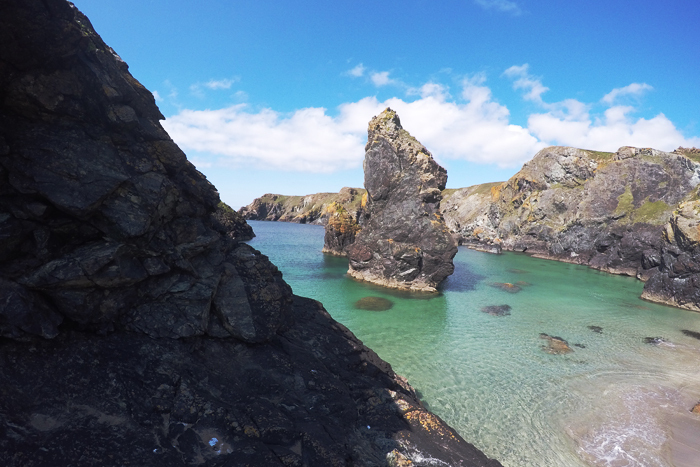 It was the most fun and beautiful day and Kynance Cove is by far one of the prettiest stretches of coast I have ever visited. I would happily drive the six plus hours there again just to repeat this day. Wow this looks absolutely stunning. Had to believe it's in little old England! This place is gorgeous! I can hardly believe it's in the UK, it looks almost Mediterranean. Jumping into the water looks like so much fun! This is beautiful! 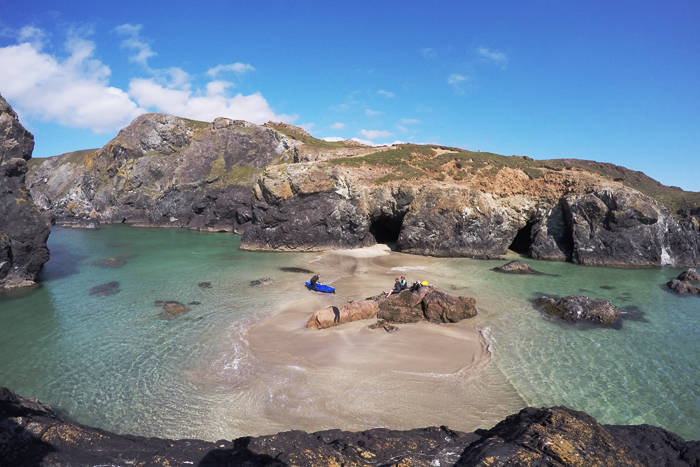 I visited Cornwall in August too, unfortunately I still felt it was too cold and we didn't have any time for actual adventuring about in the actual coves - would loooove to go back for sure :) it's such a magical place, doesn't even feel like the UK sometimes! Beautiful photos of one of my absolute favourite spots. We did a little road trip along this stretch of coastline not so long ago, so glad you loved it.